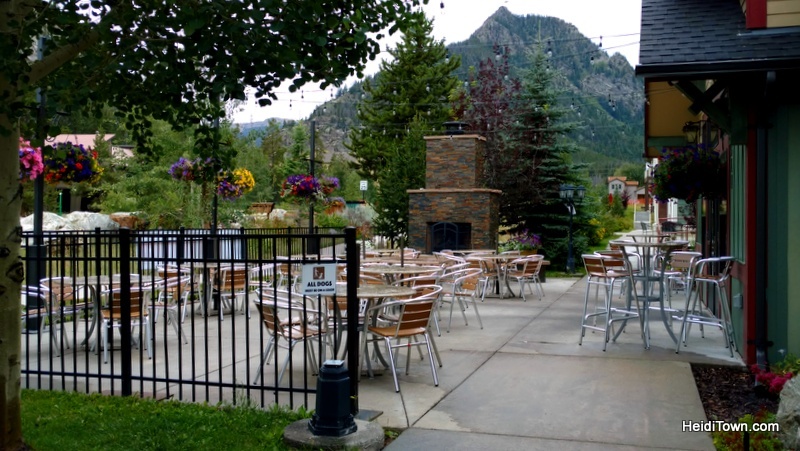 The best way to get acquainted with Frisco, Colorado is to spend a weekend in town, and that’s just what Ryan and I did at the end of August with our good friends Karen and Steve. Like many of you, I’d been to Frisco dozens of times, but had never stayed in the town, and our rental unit, a Summit Mountain Rentals townhouse just off Main Street and directly across the street from the Frisco Bay Marina, was the perfect location for our weekend getaway. Frisco is a former mining town and today, it’s still a Mecca for adventure seekers; skiers, mountain bikers, snowkiters, kayakers and more. 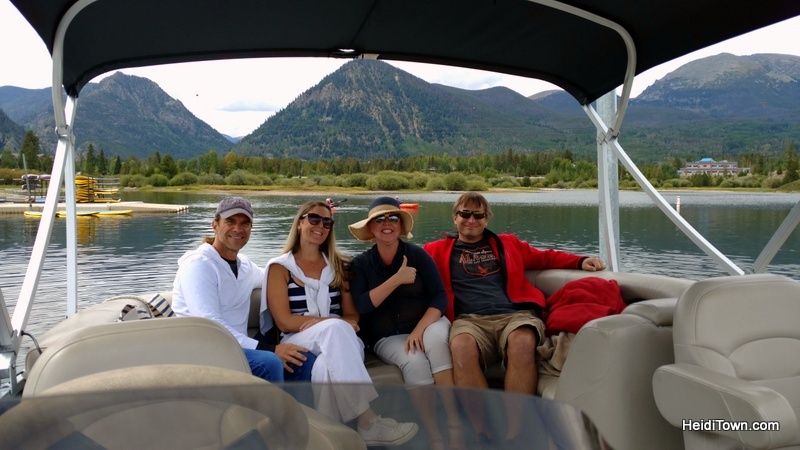 Our agenda was a gentler kind of adventurous weekend – our plan was to hit the lake on a rented pontoon boat. Our second plan was to eat lots of good food and spend time communing with one another in our townhouse hot tub. 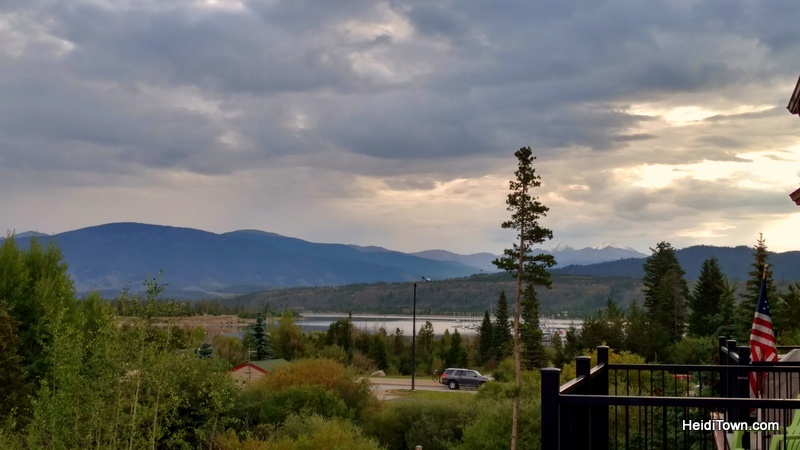 The view from our Summit Mountain Rentals’ townhouse patio. We arrived in town on a Saturday afternoon and after getting settled into our expansive Marina Park townhouse we headed down to Tavern West for happy hour and dinner. The decor at Tavern West is modern Colorado and the place has a laid back, yet stylish feel. However, it wasn’t the ambiance that had us oohing and ahhing at Tavern West, it was the food. From our appetizers of truffle tots and sausage to entrees that covered the gamut from seafood to pork, every item was beautifully plated and delicious. The patio at Tavern West on a fall-like day in August. On the way back to the townhouse, we popped into Foote’s Rest for a drink at their new outdoor bar with dining, fire pits and a big screen television. This was our coolest find in Frisco and we’d all like to give a big shout out to Kelly for the drinks. That evening we soaked and laughed and dreamt boating dreams. There are several good choices when it comes to breakfast in Frisco. In the past we’ve dined at Butterhorn Bakery & Cafe. There’s a good reason they are the #1 restaurant out of 39 listings on TripAdvisor.com. One heck of a good bloody Mary at Bread+Salt. On this visit we ate a breakfast at Bread+Salt. 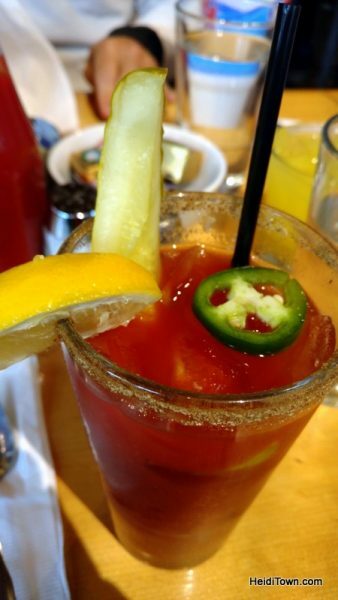 Our group had mixed reviews on the food and the seating was tight inside, but the bloody Mary’s were top-notch. I’d like to try the patio here for lunch sometime as it’s situated right on Main St. with the hustle and bustle of Frisco all around. The weather on our trip was a bit drizzly until we pulled our pontoon boat out of the docks at Frisco Bay Marina on Sunday afternoon. As the clouds parted and the sun shone warmly down on us, I could almost hear the angels’ trumpets play. We had a two hour boating excursion ahead and we intended to make the most of it. 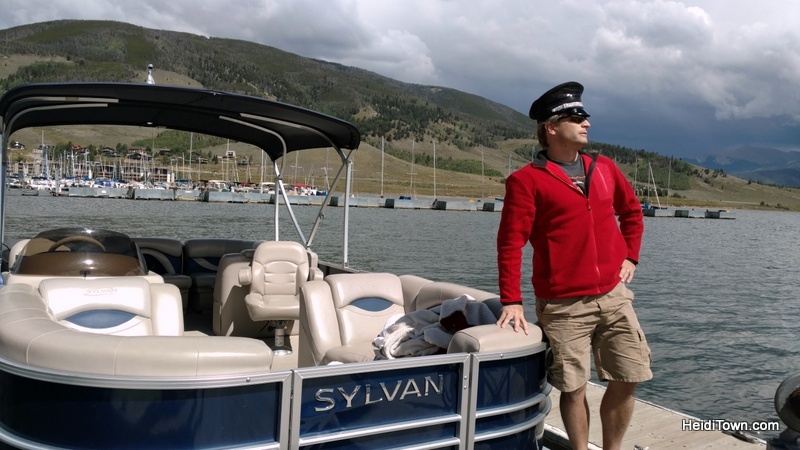 Captain Ryan poses with “his” pontoon boat. Ryan was the captain of our “ship” and we tooled around for awhile, heading up towards Keystone and then towards Dillon. We decided to dock the pontoon boat at Dillon Marina and disembark for a cocktail at Pug Ryan’s Lakeside Tiki Bar. Pug Ryan’s Lakeside Tiki Bar at Dillon Marina. 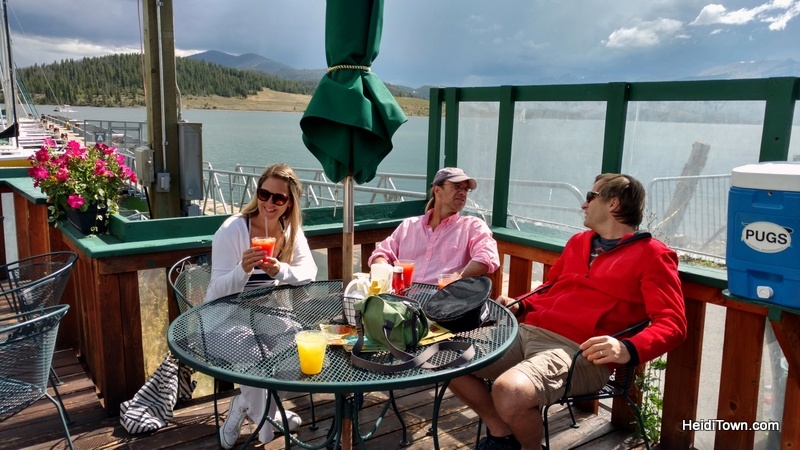 We had just enough time for one drink before gathering clouds motivated us to return to our boat and start back to Frisco Bay Marina in a hurry. We made it back within minutes of a downpour that would have made drowned rats of us in no time had we not already been ashore. Our good luck was the main topic of our conversations for the rest of the evening. 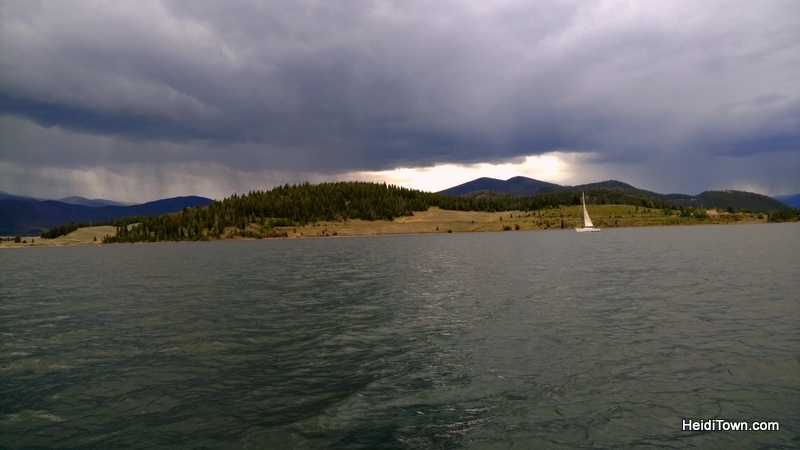 Racing the storm on Lake Dillon. On the way back to the townhouse we stopped by Safeway to load up on heavy appetizers and spent a second evening drinking and eating and laughing. 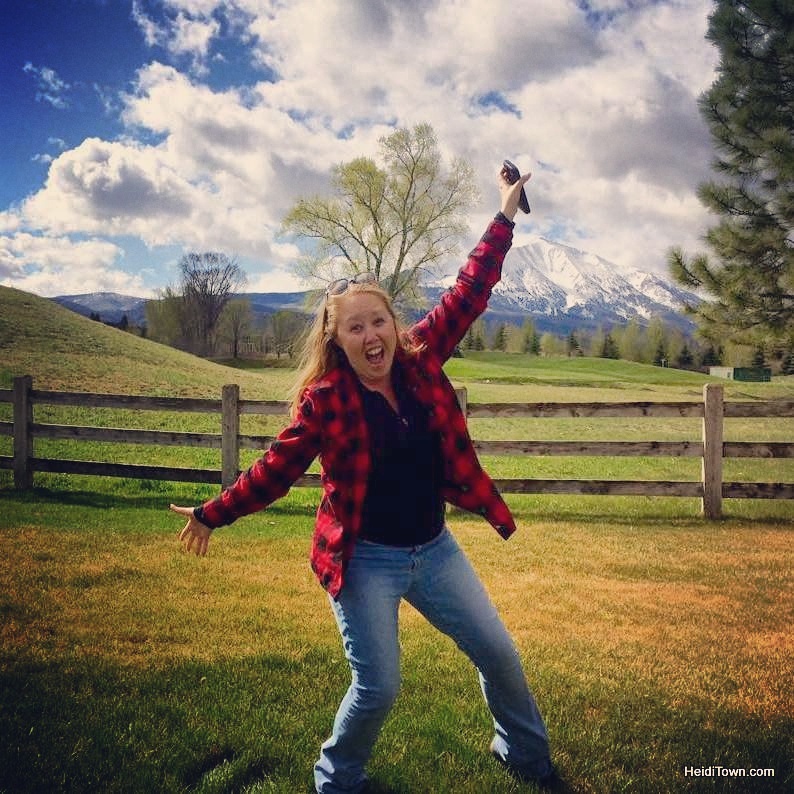 This Frisco trip was a great way to say goodbye to summer and hello to fall. A boat trip would be an ideal way to see the fall colors in Colorado this autumn. 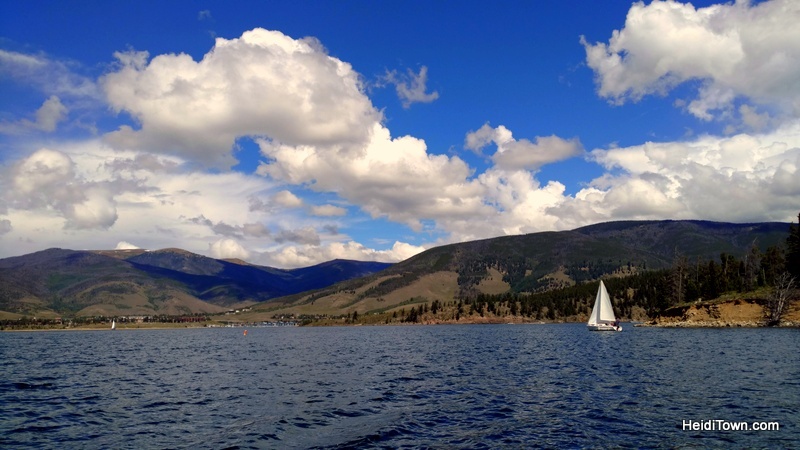 If you don’t want to rent a boat, canoe or kayak, check out the Lake Dillon Water Taxi. A Note from the Mayor: On September 10 and 11, 2016, Frisco will host Fall Fest, a celebration of Frisco’s thriving restaurant scene and local and regional art community, at the Frisco Historic Park and on Main Street Frisco. This trip was made possible by Colorado.com, #ColoradoLive and the Town of Frisco. Thank you! What a weekend!!! Too much fun! !